Hey music lovers, our friend Greg could use some help. Greg was recently in a flat-track motorcycle racing accident and has suffered multiple injuries with a long road to recovery ahead of him. Greg's an irreplaceable treasure to our music scene here in Northeast Ohio, manning the counter at Square Records, booking shows at Thursday's Lounge, The Matinee, and The Happy Dog, as well as playing drums in Ghostman & Sandman, Drummer, New Body Type, and more. All proceeds from these custom Limited-Edition Devices will aid Greg and his family to offset medical expenses this holiday. If you don’t need a Hoof Reaper, but would like to help anyway, please consider making a tax-deductible donation to his recovery fund. Thanks! 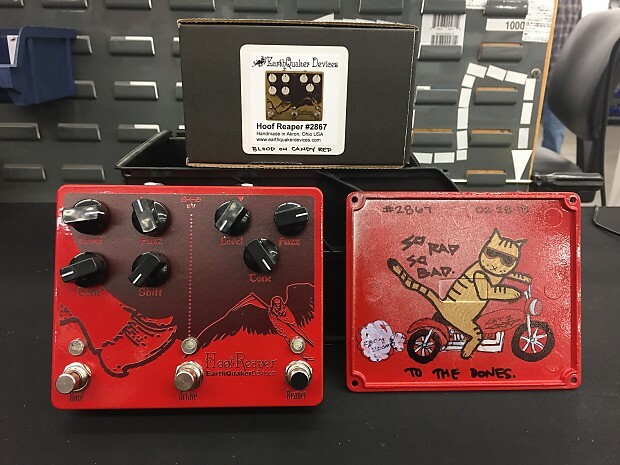 The Hoof Reaper™ features our popular Hoof™ and Tone Reaper™ fuzz pedals in one handy enclosure with the added bonus of an old school analog octave up. It was originally released as a special limited run item back in 2010 and demand was so high that we decided to reintroduce it back into our line. Capable of creating everything from subtle octave-up overtones through crushing octave squalls that simulate exploding stacks of amps. Each effect can be used individually as well as in series but the order of effects is preset for optimum performance. Use the individual switches to activate the level of mayhem you wish to unleash. Our flag-ship device! The Hoof is a no-fuss, easy to use device capable of sounds from warm, gritty overdrive to a huge sustaining fuzz. It’s a germanium/silicon hybrid muff style fuzz (based on the old green Russian muff) with massive amounts of volume on tap and smooth amp-like sustain. It has a tighter, cleaner sound than most muff’s which makes it more cutting and discernible in a band setting. The shift control is the key to the Hoof’s character, it alters the frequency response of the tone control. Clockwise scoops the mids and counterclockwise enhances the mids. The Hoof has become the go-to fuzz for many well-known fuzz connoisseurs. The Tone Reaper is a vintage style fuzz device based on the “3 knob” bender. It’s a silicon/germanium hybrid capable of producing a wide range of tones from every bender era with careful tweaking of the tone and fuzz controls. From thin and spitty to thick growling sustain, its all here. This is a classic monophonic octave up that will add a swelling octave to the fuzz tone! Since it is monophonic the effect will be more pronounced when using the neck pickup and playing above the 12th fret. Shift: Controls the mid frequencies. More pronounced to the left, scooped to the right. This device features Flexi-Switch™ Technology on the Octave switch! This relay-based, true bypass switching style allows you to simultaneously use momentary and latching style switching. · For standard latching operation, tap the foot switch once to activate the effect and then tap again to bypass. · For momentary operation, hold the foot switch down for as long as you’d like to use the effect. Once you release the switch the effect will be bypassed. The Hoof and Tone Reaper feature relay based true bypass switches. Since the switching is relay based, it requires power to pass signal. The Hoof Reaper can be powered by a standard 9-volt DC power supply with a 2.1mm negative center barrel. We always recommend pedal-specific, transformer-isolated wall-wart power supplies or multiple isolated-output supplies. Pedals will make extra noise if there is ripple or unclean power. Switching-type power supplies, daisy chains and non-pedal specific power supplies do not filter dirty power as well and let through unwanted noise. Do not run at higher voltages! We ship with tracking to the Continental US. Shipping in the US is $15 shipped through Fed Ex or UPS. Buyer pays duties, taxes, and fees.